I've read a lot of goal posts from friends' blogs and others I've found through Yvonne's 2016 Planning Linky Party as I've chipped away at writing this post this week. I really admire those of you with nice concise lists or just one big goal. I think part of the trouble with writing it all down for me is that I want to do all the things! One realization for me this week is that just because it's a 2016 goal, it doesn't need to be implemented starting in January. I'll obviously have to pick and choose my priorities out of my endless list of ideas as I move into 2016, just as I always have to decide what my priorities are on my seemingly endless WIP list. ;-) Last year I wanted balance. (I still do.) A stressful personal year made that hard, but throughout I kept sewing. It's something I do to help achieve balance in my life. I'm sorely behind on (many things in life, including) blog reading and it's been great to catch up this month with some bloggers that I follow. In recent months I feel like I've made some quilty acquaintances into quilty friends. That feels great. I'm really thankful for all the different ways I'm connecting with people in the quilting world. Looking back at my 2015 goals helps me realize how far I've come in a year as a quilter and a blogger. Despite the "I didn'ts" in my review of those goals, I feel really great about everything that I did do. I wanted to cut my WIP list in half. I didn't. But... of the 24 items on the list in January 2015, I've finished ten of them. Woo hoo! That included a king-sized quilt for our bed that wasn't even cut out yet, and at least a couple projects that had been in the works for years. I also made significant progress on three of the others, including my oldest WIP (started in 2004). Unfortunately (not really), I started a bunch of other projects I was excited about, so my list is still long. It's just more full of stuff I'm fired up to work on. I count that as a win, though I think I'd still like to have fewer items on the WIP list in general. In 2016, I want to finish one WIP per month (from the current list). Quilting Bees were great fun this year (and added one, and soon a second, WIP to the list). I'll be continuing in 2016 with The Bee Hive as well as do. Good Stitches, a charity bee. As for Block of the Months... I never even started Leah Day's Dancing Butterflies (oops!) and I'm way behind on Intrepid Thread's Patchwork City Metro Area BOM. However, I'm super excited about getting back to the Metro City project and it will be an epicly awesome finish when I get it done. In 2016. Or, let's be real, maybe 2017. I never got around to sewing with knits, but I did do a number of zipper pouches and even buttons and buttonholes for my latest shirt for my son. I'm pleased to have developed some of my non-quilting sewing skills this year. 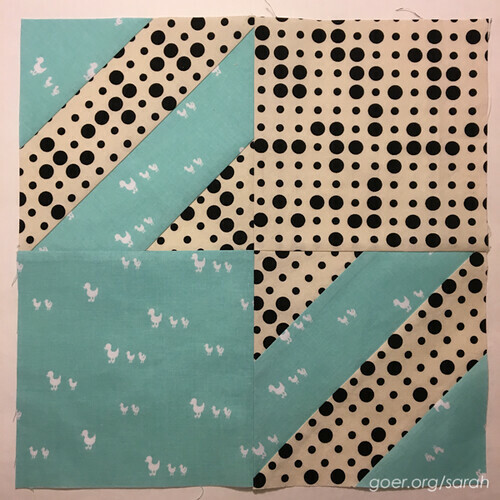 I designed mini quilts for a few of my swaps and put out two blog tutorials: the Watermelon Plate block and the mini charm Zig Zag Placemats. These were both for blog hops and I participated in a few others, including Charm Dash and the 2015 New Quilt Bloggers hop. I taught my five year old son to quilt. He finished three quilts this year: Jungle of Animals, Rainbow Swift and House on the Hill. Here's some of what I'm thinking of moving forward. Blog daily. No, not a blog post a day, but progress for the blog daily. There are a lot of ways to achieve that: planning, photography, draft writing, design work, etc. Read blogs more regularly. In my very stressful year, this was one of the things that went. Lately I've gotten to do a bit more blog reading and realized how much I've missed it. Question: How do you keep up with reading your favorite blogs? Tutorials and patterns. 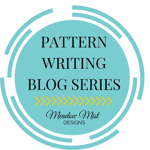 I'm super excited about Cheryl's Pattern Writing Blog Series starting in January. I find this very timely as it's one of the things that didn't happen for me this year. I did do some design work, but it didn't translate into any finished patterns. Brush up my technical design skills. In an effort to support my pattern writing goals, I think I'll be dusting off a copy of InDesign and relearning what I once knew (from teaching yearbook in 2002-2006). Thanks to Daisy of Ants to Sugar I recently fired up Illustrator for the first time. I should also spend some real time learning EQ7 since so many quilters love it, but it just hasn't clicked for me yet. Linky parties. Get back in the routine of linking up as well as host my own linky parties. Now to settle on which of my three ideas to go with first. Tweak my blog design. Through the help of some peer critiques from the New Bloggers group, I improved the look of the blog this year, but there are more things I'd like to achieve. A logo and new blog header, for one (er, two). I've started a style sheet that I plan to develop and in general I'd like to work on branding my blog. Thank you for visiting and Happy New Year! I'm linking up with Yvonne's 2016 Planning Linky Party. Posted in Quilting. Tags: goals on December 31, 2015 by sarah. Stash Bee: Lyssa asked us to make 16.5" x 12.5" bookshelf blocks for her. 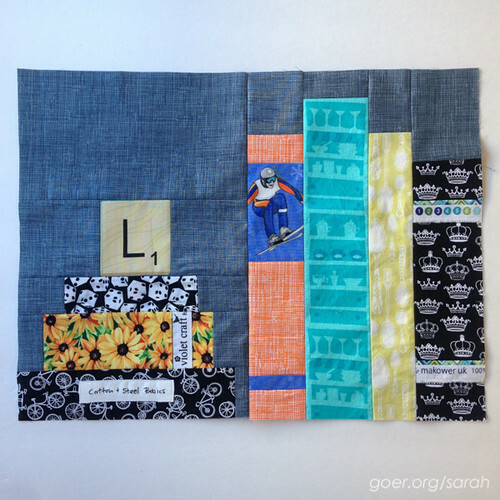 In her post she shared some of her interests which I had a great time incorporating into her block. She told us, "In addition to sewing, I love gardening, baking, hiking, skiing, biking, reading, playing board games, gnomes, the beach, collecting dishes, traveling, waterskiing, and hosting dinner parties." 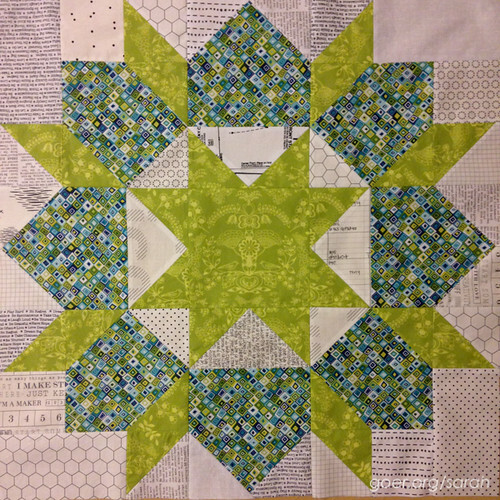 The Bee Hive: We made the paper-pieced Star Plus block for Laura. 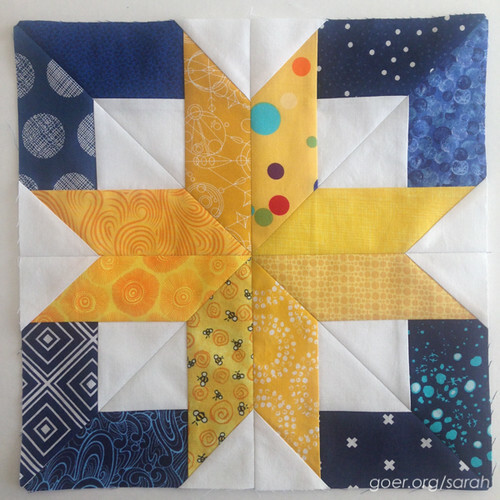 Yellow and navy is a great classic combination and I'm sure the finished quilt will be stunning. do. Good Stitches: In October we made these Mosaic blocks by Patchwork Square for Diane. I love the fun scrappy look of these charm friendly blocks. 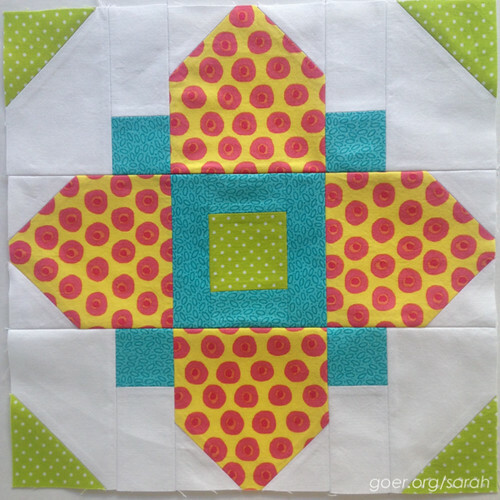 Stash Bee: For our last block of the year Bev chose the Quatrefoil block (which is actually a Bee Hive tutorial). Her colors were aqua, pink, lime green, orange, yellow and red which gave us a lot to chose from. I immediately gravitated to the yellow and pink print in my stash which I had yet to use. Since that one was a little wild, I think it paired nicely with the lime green and aqua blenders I used in the other positions. 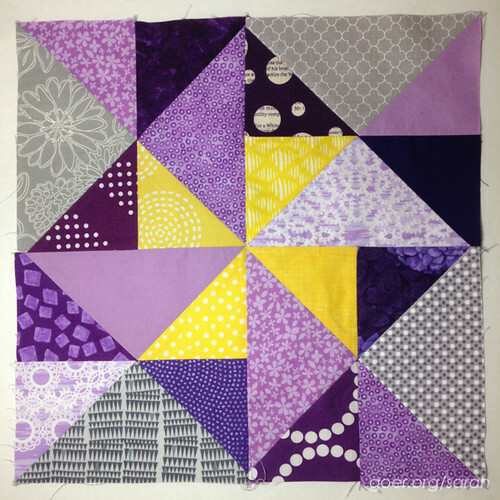 The Bee Hive: Our November block was purple, yellow and grey Spinwheel blocks for Amanda. I love the pop of yellow, and I'm always excited to be working with purple! do. 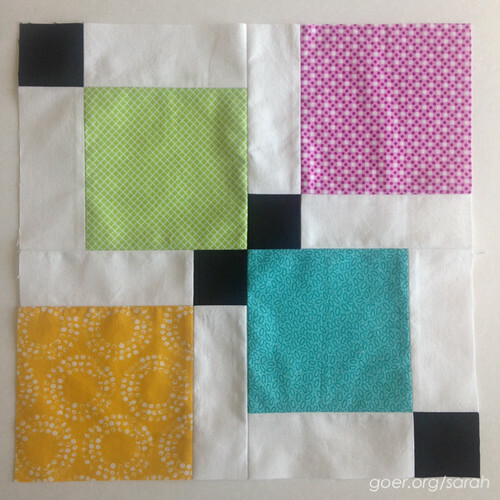 Good Stitches: Ailish challenged us with some improv piecing this month. The theme was symbols: "anything from plus signs, Xs, asterisks, pound signs etc." And we were asked to use bright fabrics in red, orange yellow or green with a black background. I knew immediately that I wanted to make an ampersand. I quickly got my first block done. Improv hashtags are fast! But it took me quite a while to complete my ampersand. Overall I'm quite happy with it. Though I'm not sure I'd try one again! 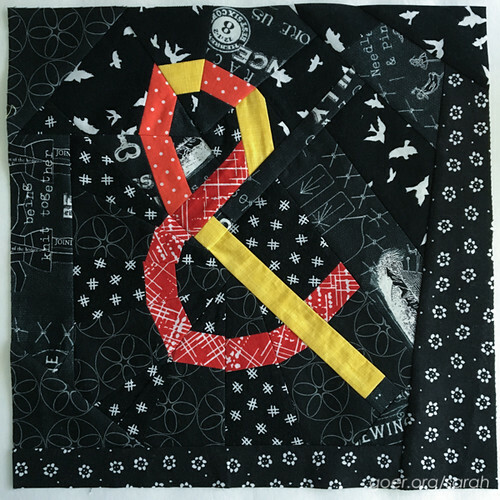 I used eight fabrics for a total of 61 pieces to make the ampersand block. I used darting, y-seams and hand piecing (for two tricky seams). I lost count the number of times I had to rip out seams and the total time spent on the block (many episodes of Once Upon a Time, thank you Netflix). 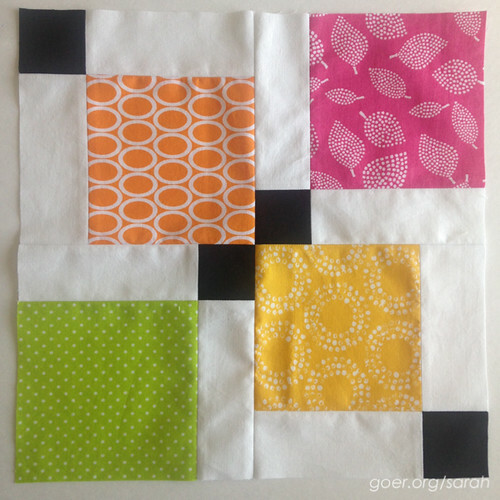 The Bee Hive: In December, Tisha chose for us to make the Houndstooth block. She picked a variety of solid colors as our inspiration and wanted our choice to be paired with a black and white print. I chose to go with the turquoise color. These blocks went together super quicky. The striped sections are paper pieced and they are easy to chain piece since they are just rectangular strips of fabric to start with. 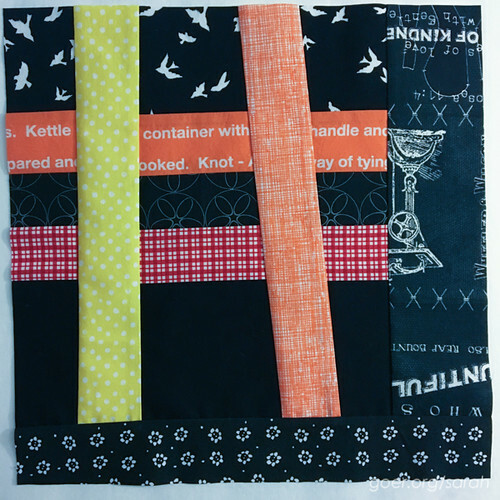 (The tutorial gives instructions for cutting these strips before piecing, which I appreciated.) A great big thank you to Tisha for running our hive this year! Next month is our last month for the 2015 bee and finally my month to be queen, but I'll be continuing for 2016 with The Bee Hive. The rest of my 2015 bee blocks can be found in these previous posts: January, February, March, Q2, Q3. Thanks for visiting! I'd love to hear if you've joined a bee for the first time 2016. I'm linking up to Let's Bee Social. Posted in Quilting. Tags: bee blocks, do. 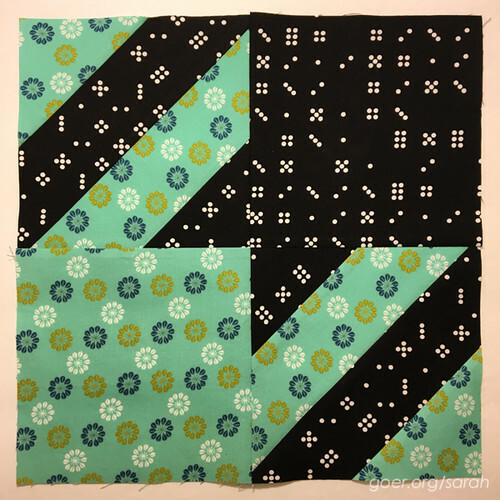 Good Stitches, improv blocks, improv piecing, paper piecing, Stash Bee, The Bee Hive on December 29, 2015 by sarah.